No matter what happens somewhere, the people who participated or were eyewitnesses present at the scene can tell in first-person form what they saw and heard to the world. Then why would anyone need newspapers anymore? No, people will still continue to read newspapers, because bloggers do not have the reporters' expert journalistic knowledge and skills. They don't have the feel for news and they can't do in-depth investigation. Therefore, most of the "news" on blogs lack the news background, information and data. Very few bloggers can provide detailed reports. Without the editing, evaluation and wordsmithing by editors, most of these reports are not very readable. Apparently the Xinjiang guy who opened a restaurant on this street got into an argument with a city official. Afterwards, I don't know what happened but a cop got taken hostage. The hostage must be a chief ha ha. 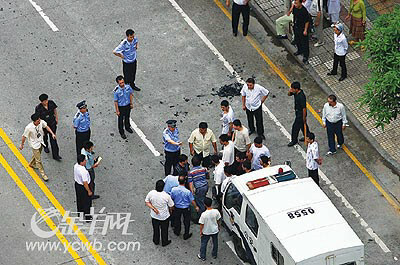 At around noon yesterday, the Linhe East Road in Tianhe district was blocked off to traffic in both directions for two hours. The incident arose when municipal administration workers got into conflict with people from a restaurant during the course of law enforcement. After a person from the restaurant was injured by the law enforcers, more than 30 people from the restaurant gathered together and used axes and poles to face off against the municipal administration workers and police officers. Some of those people were even upset enough to bring out at least five gas canisters and placed them in front of the municipal administration and police vehicles. During that time, the gas canisters were turned on and off several times. After two hours of negotiations, the matter was finally resolved. At around noon yesterday, a Mr. Huang passing on Linhe East Road observed that were barbeque equipment and broken flower pots on the pedestrian sidewalk outside a restaurant. There were several vehicles from the municipal administration parked on the road. There was a man standing in front of the truck. "He had a Japanese samurai sword in his hand and he was preventing the municipal administration truck from leaving." According to eyewitnesses, the restaurant had placed the flower pots and barbeque equipment on the sidewalk. The municipal administration workers wanted to confiscate the equipment, but the restaurant workers resisted. Soon, more municipal administrators, police officers, fire fighters and street administrators arrived at the scene. A section about 200 meters long on Linhe East Road was closed to vehicular traffic in both directions. There was a public bus stop within the blocked zone, so bus passengers missed their stop. At around 12:20pm, a restaurant worker sat down on a chair on the sidewalk. His head had been injured during the clash with the law enforcers and blood soaked the right side of his shirt. However, he insisted on not going to the hospital. Several other men were walking around with knives and poles in their hands. Several minutes later, 20 to 30 riot police officers rushed over with shields in their hands. More than a dozen restaurant workers went up to meet them while wielding axes and poles. The police were ordered to retreat. There was one police vehicle and three municipal administration vehicles parked by the roadside. The restaurant workers had placed gas canisters in front of them. When the workers saw the riot police coming slowly towards them, a short man picked up a canister, twisted open the cap and charged towards the police. At the hissing sound, all the spectators screamed and backed away. During the negotiations, the gas canisters were turned on twice. At around 1pm, the gas canister in front of the police vehicle was removed and that vehicle was driven away. At 1:20pm, five or six other people came from elsewhere to back up the restaurant people. Negotiations were conducted inside the restaurant. According to informed sources, the restaurant side had detained two municipal administration workers and demanded the assaulters be turned over to them. 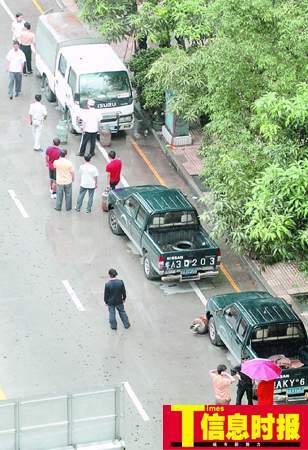 At around 1:40pm, a restaurant worker made an indication to remove the gas canisters in front of the municipal administration vehicles, but he was overruled by another person on his side. At 1:41pm, the negotiations reached initial results. The injured person who had insisted on not getting medical treatment agreed to go to the hospital. However, the restaurant workers still did not agree to remove the gas canisters. 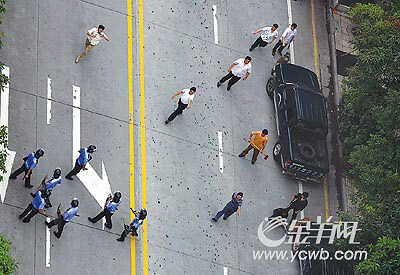 Deciding that there would not be any more danger, the police allowed traffic to move again. But after pedestrian traffic moved for a few minutes, the restaurant workers opened up the gas canisters twice again. So the road was blocked off again. After more negotiations, the restaurant workers finally agreed to remove the five canisters in front of the vehicles. At 2:14pm, the road blocks were removed. Information Times (via QQ) had a similar report with the footnote (informers Mr. Cao and Mr. Liu each received 100 RMB for calling the newspaper). At YCWB (via Sina.com), the informer Mr. Xing received 200 RMB. So the newspapers depend heavily on civilian informers. 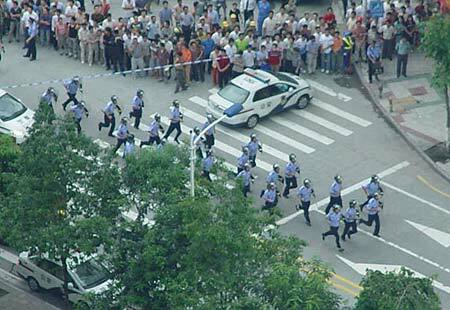 If you go to Baidu News, you can also retrieve previous reports about the 100-day campaign to clean up the Six Sources of Chaos in Guangzhou, with a total of 8,085 cases by that time (see, for example, Sina.com). This gives the background and context.